Today is the last day of 2015, just stating the obvious to myself. 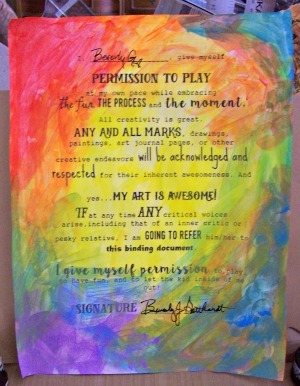 I signed up for Carolyn Dube's 5 lesson Permission to Play Workshop to try to give myself a jump start into 2016. I've done a lot of Zentangle in 2015 because I can pick it up and put it down easily when general living calls out for attention. There's no drying time with it. I tried to put the picture with the link to this workshop on the right side of my blog, but my techno cells aren't in gear yet today. If you click on the above it will take you to Carolyn's blog and you can find this workshop as well as some others she teaches. She gave us this permission slip to print off and get some paint on to spur us on play. I will be putting it on the next to my calendar in my studio so as I glance up perusing what is on tap for the day and month to come I will be reminded to get some play in also. I used cheap acrylic paints and some water to go for a rainbow effect. As I moved to the bottom right corner I forgot to let this area dry a bit and as Carolyn has said in another workshop she teaches there are colors that are just not friends unless you dry between applications. I need to learn to slow down. It seems when I get a paint brush with paint on it I think I need to hurry up and get all the colors on at once. I have all my cardboard pages cut and ready to gesso and add papers and ephermara to which is the next step in this workshop. I will be playing with those the rest of today so I can hopefully start out the New Year posting what I've accomplished so far and continue playing in my studio tomorrow. I hope all you artists out there in blog land and beyond will give yourselves permission to play this year and create beautiful pieces of art. They are food for our souls. Happy New Year to all and I hope all your dreams and resolutions come to be the way you have dreamed them.